The second panel at today's conference was called "Happily Ever After? What it Means for Society to Drastically Prolong Life." The first speaker was Ted Fishman, author of the concisely-titled book Shock of Gray: The Aging of the World's Population and How it Pits Young Against Old, Child Against Parent, Worker Against Boss, Company Against Rival, and Nation Against Nation. The title actually tells you a lot about his talk, which seemed remarkably level-headed and even-handed for this conference. Fishman didn't seem to have a dog in this fight, but just noted that life extension could play out a number of different ways, some rather good and others quite horrific. He worries in particular about social engineering projects, noting in particular that the Chinese went from encouraging families to have ten children under Mao to the notorious one-child policy. Fishman made this observation about global conflict: "If we think about the fight people are already willing to put up over the life they have, imagine if we were fighting to preserve much longer lives." I haven't read Fishman's book, but after his brief talk, I'm very interested to do so. Many of the conference speakers commented on how the population is aging at a staggering rate, with the fraction of the population over age 65 increasing from less than a tenth a few decades ago to the territory of a quarter or a third in the near future. Which reminds me of a perennial, basic problem for transhumanists and proponents of radical life extension: ostensibly, they should be celebrating this great gain in long life. Yet their ideology is, almost without exception, based upon a fetishization of youth and a loathing of old age. There's a weird sense in which getting closer to their goal actually gets them further away. Which may be part of why today, at the greatest point for longevity in human history, we have a conference panel that refers to a "war on dying" and a "battle against aging." As I've noted before, transhumanists paradoxically are only likely to feel more desperate and more martial as they get more of what they want. One wonders what they are liable to do as that sense of desperation increases. Ted Fishman and Jason Furman. Speaking next was Jason Furman, Deputy Assistant to the President for Economic Policy, and Deputy Director of the National Economic Council. He gave a wonky, mile-high analysis, and noted among other things that the Obama administration's entire contingency plans for what we would do if the population started living to 150 or 200 consists entirely of Furman's own thoughts on this in preparing for the conference over the last few days. I think I actually find this more reassuring than not. Next up was S. Jay Olshansky, a demographer, frequent commentator on aging issues, and professor of epidemiology at UI-Chicago. Olshansky said that with life expectancy, you reach a point of diminishing returns: when you keep putting in the same amount of effort, you get less and less for it, which is why we've been stuck with life expectancy in the 75/80 range for a while. He noted that even if we completely cure cancer, we would only gain 3-3.5 years in life expectancy; for heart disease, 4 years; for both together, less than the combined 7 years. Life extension should not be our goal, Olshansky argued; health extension should be. If we radically extend life, we may push into the region of life spans where we see types of ailments and degenerative diseases that are far worse than we've seen today. We may get to a point, that is, where the tradeoff is worse. But if we delay the aging mechanisms entirely, our situation could be much better: a three-year delay in the biological onset of aging would be the equivalent to curing cancer. And he thinks a seven-year delay is possible. Olshansky's presentation seemed to be the most sensible, levelheaded, practical-minded one here — although I am skeptical about the notion that we will find horrible new degenerative diseases if we push up the life span, unless it's well past the range that many people are already living now. After Olshansky, Arizona State University professor Jason Robert (pronounced ro-BAIR) gave a weirdly rambling exposé of how he recently lost a hundred pounds, won $4,000 at a slot machine, and bought a sweet bike. (I'm not making this up. I have no idea what the connection to anything was, though he tried to explain it later.) 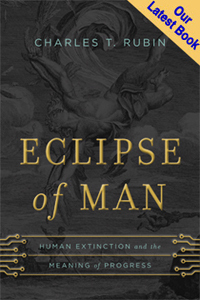 Robert offered a whirlwind tour of the potential ethical issues related to radical life extension — changes in the social structure chiefly, changes in distributive justice, and changes in human flourishing. Unfortunately, he didn't seem to have time enough to really go into any of these issues. In his presentation, Robert divided the bioethics world into shiny-eyed bio-libertarians, naming Ron Bailey as an example, and set up quite a pair of straw men in Francis Fukuyama and Leon Kass as bio-Luddites who don't like any technology. These are caricatures of all three men. But Robert offered these caricatures so he could set himself up as the reasonable moderate, offering a "liberal" approach, whereby people can get together to discuss different understandings of the good, and how those understandings should lead us to develop new technologies. Which is in fact just the idea behind Leon Kass's approach (and, I think, is implicit in Fukuyama's and Bailey's expressions of their own ideas of the good). The Q&A session following this panel was mostly unremarkable, except for one speech by Jay Olshansky. He said he was very disturbed by a conversation he was part of the evening before the conference — a conversation among the panelists over dinner last night. As Olshansky related it, talk of life extension and aging populations very quickly gave way to talk of health-care rationing and killing off the elderly to make way for the young. He didn't name names, and nobody stepped up to confirm or refute what he said — in fact, it wasn't mentioned again. NIH director Francis Collins had to go testify on Capitol Hill, so the keynote presentation was canceled. So that's all she wrote. For some alternate coverage, delivered with more of an air of neutrality and picking up on various details I missed, check out James Hughes's post on the conference.